Welcome to Sarah & Melanie's Downton Abbey Recaps/Discussions! We're such big fans of the show, we had to talk about it! Reminder: please no spoilers if you've watched ahead. And this is a recap, so there are spoilers below! Sarah: This episode was only an hour compared to last weeks epic two hours, so in some ways it felt like there wasn't as much happening. Melanie: I agree, this episode dragged a bit for me. Most of the plot lines I wanted more of were put on hold in order to introduce new characters (the soldiers) and brand new skirmishes among the characters. 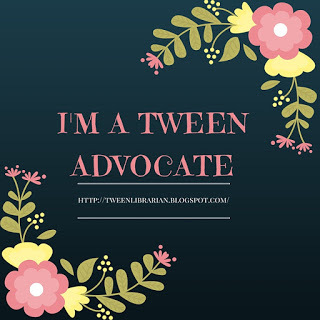 Sarah: I think there was just so much going on last week, that this episode felt lighter. Sarah: Downton is being turned into a convalescent home for wounded officers and this is creating all sorts of power struggles within the house. Isobel and Cora are fighting a lot about who is really in charge. Everyone is having a bit of a hard time giving up their home and having it overrun with officers. The way of life they have been used to living is really beginning to change as the rooms are taken over. Melanie: I loved the look on Lord Grantham's face when he saw that one of the rooms had been converted to a rec hall, complete with a ping-pong table! Sarah: I found the power struggle between Cora and Isobel interesting. I thought they had been getting along recently, but this seems to have opened up a new reason to dislike each other. I think Cora is upset over the fact that she's loosing her home and she also feels like she's loosing control since Isobel has come in and believes she's now in charge. Melanie: Isobel was even trying to boss the dog around. I'm on Cora's side in this instance; it was nice to see a bit more of her personality. Sarah: Agreed-we get to see a bit more of Cora in this episode and I think this power struggle between Cora and Isobel will be fun to watch. I liked how Matthew and Mary were joking a bit about it and saying how they had to keep their mothers away from each other! 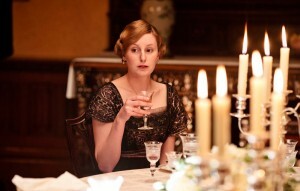 Sarah: O'Brien suggests to Cora that Thomas run the day to day management of Downton. She agrees and Thomas gloats over his new position, believe that he can finally boss everyone around. Melanie: I'm confused over why Thomas got the job. Lord Grantham and Carson both know he stole from them. Letting a caught thief back into your home seems a bit absurd. Sarah: Exactly. Even though Cora doesn't know about the theft, Lord Grantham and Carson do. I don't know why he got this job either. This was the most annoying thing from this episode. Anything nice I may have felt about Thomas last week is gone. He's back to his evil scheming way and I don't like that he's "in charge" at all. I did appreciate that O'Brien stood up for Cora and showed that she's changed her mind a bit when Thomas confronted her. I think O'Brien is still annoying and catty, but she's more human than Thomas. Melanie: I think O'Brien's protectiveness over Cora is mainly due to guilt (Sarah: Agreed-I think she still feels guilty about the baby last season), but I agree on the subject of Thomas. He's reveling in his power, even though we haven't actually seen him do anything that makes him seem to be in charge. Sarah: Ethel gets excited about the fact that Downton is now overrun with officers, seeing this as a chance to flirt with the men. Anna warns her to stay away, but she can't help herself, catching the eye of one of the officers and being an obvious flirt with him. I still don't like Ethel. She's annoying and makes bad decisions and I find her to be shallow. She has not grown on me at all in this episode-I still miss Gwen. Melanie: I miss Gwen too. I'm a bit miffed that we haven't heard from her at all. You'd think she'd at least write to Sybil. She basically just disappeared. Sarah: Yes! They could have at least mentioned her!! Branson explains to Sybil that he's been called up but has no plans to go to war. He hopes to rebel and humiliate the army, only to discover that he has a heart murmur and won't be able to fight after all. Sybil is relieved that he won't be going to war or to prison, but Branson is convinced he needs to do something to avenge his cousin's death. 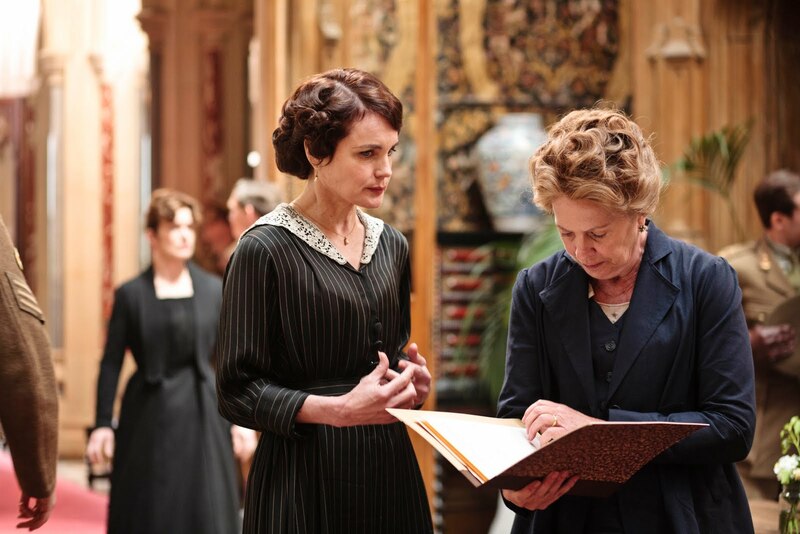 Later, when General Strutt visits Downton, Anna finds a note that explains to Sybil that he is sorry. She rushes to show the rest of the staff, believe that Branson, who has stepped in as footman for the meal, has done something to the soup and will poison the General. Branson instead reveals that he mixed it with oil and was planning on spilling it on the General's head. Melanie: My imagination really got carried away while watching this. I thought Branson's note to Sybil was a suicide letter. I was worried that he had a gun stowed in the soup bowl and was planning on shooting the General and then himself. Talk about overreacting. I was relieved to find out that he only planned to be rude, not lethal. Sarah: Me too! I've been a fan of Branson, but this episode tried to play him in a different light and I'm not so sure I liked it. I guessed that his "murderous intentions" that they were leading you to believe that he had towards the General would turn out to be something else (I thought he was going to punch the General or something along those lines). But they way they were leading you to believe that Branson wasn't a good guy was a bit frustrating. Melanie: I'm wondering what Branson's punishment would be. To be considered unpatriotic during a time of war can be incredibly dangerous. Although it was a bit discomfiting to see another side of him, I like knowing just how deep his beliefs go. Sarah: Agreed. I liked getting a bit more depth to Branson. I still like him though and the hope for a Branson/Sybil romance is still there. Anna believes she saw Bates in town and after Mary asks her what's been distracting her and she confides in Mary. 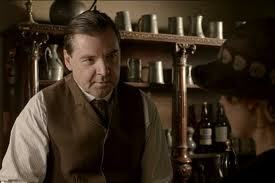 Mary suggests that she give Sir Richard a call and find out if Bates really is in London or in town. She returns with news that Bates has been working in a pub. He claims to have new proof of his wife Vera's unfaithfulness and believes he can finally divorce her. He tells Anna it won't be long now. Melanie: And Anna says she'd be willing to be Bates' mistress. His mistress! She's getting so desperate, poor woman.She did look awfully cute using Mary's curling iron, though. Sarah: Yes, I loved how she did her hair all pretty just to go meet Bates. When she told him she would be his mistress-that was heartbreaking! This Bates/Anna thing is dragging on! I just want them to be together already! I hope Bates finally has a good plan in place. Stop leading him on Daisy! 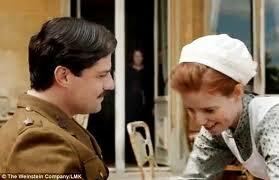 William is going off to war and asks to spend his last night at Downton. Daisy thinks that William is going to propose and she's nervous because she doesn't want to lead him on. Mrs. Patmore encourages Daisy to accept, telling her again she can't send William to war with a broken heart and that he needs something to hold on to and hope for. William announces they are engaged and Daisy says they'll marry after the war, only to have William say he can't wait that long. 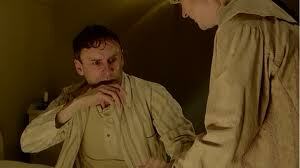 Lord Grantham suggests to Matthew that he take William on as his servant to help protect him and watch out for him. Melanie: I think these two would be cute together if they ever got themselves straight. 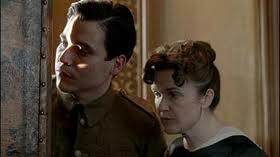 I can sort of understand Daisy; would you really want to send a young man off to war heartbroken? Sarah: Poor Daisy. She's in such a tricky situation. I can see where Mrs. Patmore is coming from and I don't want William to get hurt. But Daisy is stuck now and she's not sure what to do. I think both of them are a bit immature and they really could solve their problems if they would just talk!! Lavinia's secret is revealed! She uncovered a scandal about her uncle and sold them to Sir Richard who then published them in his paper, causing the Marconi Scandal of 1912. Aunt Rosamund is convinced that Lavinia did this because she and Sir Richard were lovers. She and Violet tell Mary she should confront Matthew and share this news with him. Mary on the other hand, discusses it with Lavinia, who says yes, she did sell the secrets, but only because her father was very much in debt to Sir Richard and this was a way she could help him. She tells Mary that she was never lovers with Sir Richard, but did what she had to do in order to save her family, even if it meant implicating the Minister in the scandal. Mary has the chance to tell this Matthew, but passes on it, instead telling Matthew how perfect she thinks Lavinia is. Sarah: Lavinia also is wearing her frumpy green dress again, and even though she seems nice enough, I want her gone. What I'm curious about now is wondering if Mary still intends to go through with her plan to marry Sir Richard, now that she knows to what lengths he'll go to get what he wants. And I'm wondering if Lavinia is actually telling the truth. This scandal opened up a whole new pot of worms! Sarah: Yes, so much to think about here. Will Mary still end up with Sir Richard? I hope not! I wondered if Lavinia was telling the whole truth either-I think she still has some things she's hiding. This whole plotline was heartbreaking to watch! I really like Mary this season. She's grown up, she's not being so selfish, and she seems to care about those around her. She didn't complain about the convalescent home, which old Mary would have done. She also passed up the chance to break up Matthew and Lavinia. The rest of her family is still hoping for a Matthew and Mary reunion, and while it's clear she cares for him, she seems to see that she's missed her chance and there's nothing she can do about it. Melanie: Cora said the two looked so natural together, and I agree. Throughout the episode, there are bits of dialogue, just normal chatter, that makes it so obvious how well they get on together. Sarah: Exactly. The banter they share is so cute and it's clear they still have feelings for each other. Sarah: Lang has been suffering again with PTSD and has a few outbreaks of fits or nightmares, leaving the staff worried. 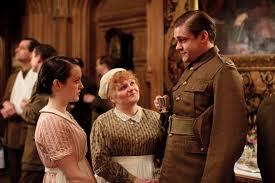 By the end of the episode, he is packing up and planning on leaving Downton. When the staff arrive in Lang's room after hearing him scream and O'Brien is taking care of him is one of the most touching scenes in this episode. Again, you see a softer side of O'Brien and I like how the staff don't immediately judge (well, except for Thomas) but instead want to help Lang. Melanie: I liked seeing this too. His screams were so awful and must have been such a shock. I'm surprised Carson still let him work for awhile longer after that. I wish him well. Sarah: I wonder if this really is his goodbye or if we'll see more of him. Sarah: At dinner, General Strutt praises Downton for their hard work and especially praises Edith for taking care of the day to day needs of the officers. It's nice to see Edith do something good and get a nice word for it! Melanie: I really wish Edith would get a consistent plotline going. She seems so aimless. I suppose that's the point, though. I did like her a bit more in this episode and am very glad she didn't try pursuing the farmer. Sarah: I think Edith is finally finding her place a bit. I'm glad she gave up on the farmer as well! Melanie: What I really want to see next week is some moving forward in at least one of the romances! Other than Lord and Lady Grantham, is anyone settled in a happy, love-filled relationship? Sarah: I know! So many storylines that are opened and then never go anywhere. I'd love to see one happy relationship somewhere! Even though this episode was a bit slower, I'm looking forward to the drama of next week. The preview has me excited! I can't read your recap since I haven't seen the second episode yet. I watched the entire first season and episode 1 this weekend (talk about bliss). Awesome recap! I feel the same way about Edith and the farmer. I'm so glad it was nipped in the bud. That is really a nice recap. i love your idea in sharing it with us. Looking for a quick recap for my friends and me before tonight's episode (we are 40 year olds)! Your recap was much more understandable and way more interesting than several other national newpaper and magazine recaps. Very cool indeed. Thank you.